We perceive the universe we inhabit has three dimensions of space and one dimension of time. Our planet wobbles slowly like a gyroscope in space spinning once per day while it “circles” the sun during its annual course. 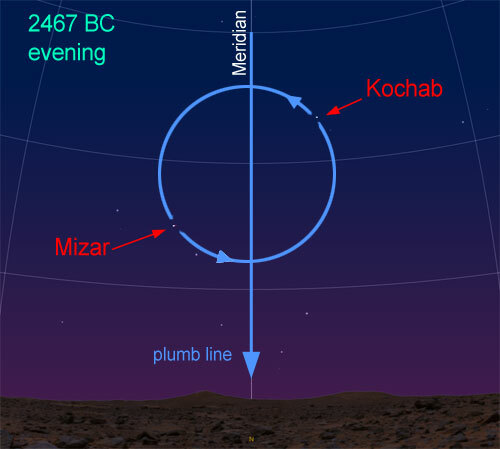 Despite of observing the sky from the “moving point of view”, ancient astronomers were able to discover and precisely describe basic astronomical cycles of our planet. They created calendars to keep track of these cycles and to predict solar and lunar eclipses. Observing the sky also enabled the ancients to establish cardinal points and latitude for any place on Earth. Looking at the Sun and the Moon could easily provide a “hint” that our planet might be also round. 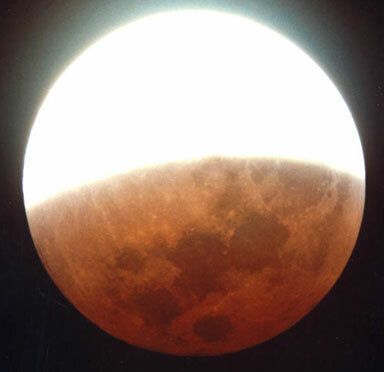 Such a “hint” could be confirmed by observing lunar eclipses (shadow of the Earth is round as well). 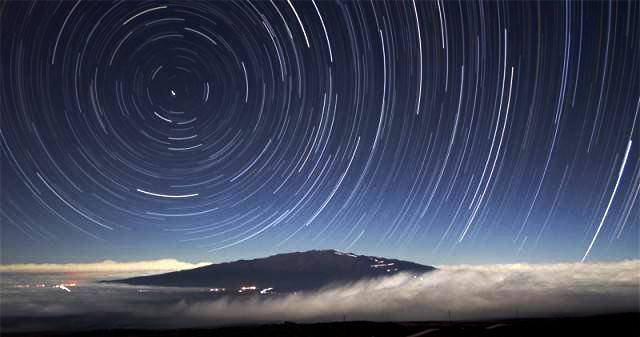 Observing the movement of stars at night as well as the movement of the sun and the moon, makes it obvious that our planet is rotating around its own axis. 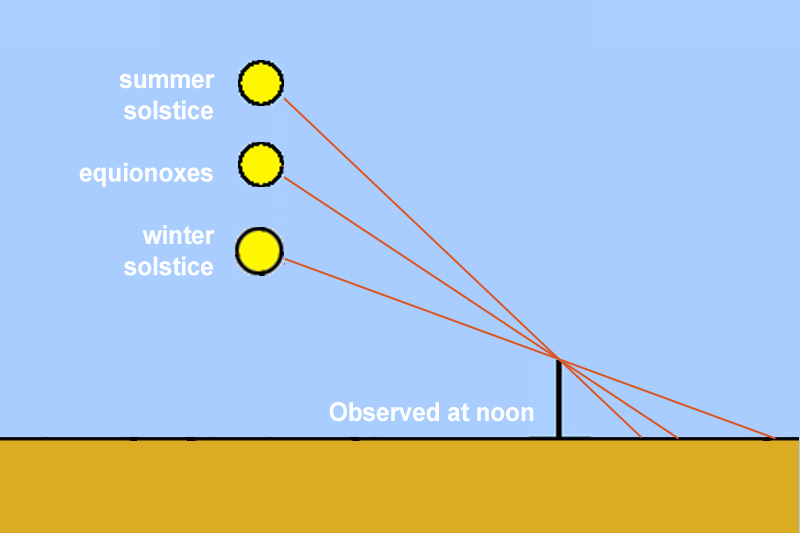 Observing during a year changes of the position of the sun at noon (or specific stars at night) relative to the local horizon could lead to discovery of the axial tilt and measurement of its exact value. 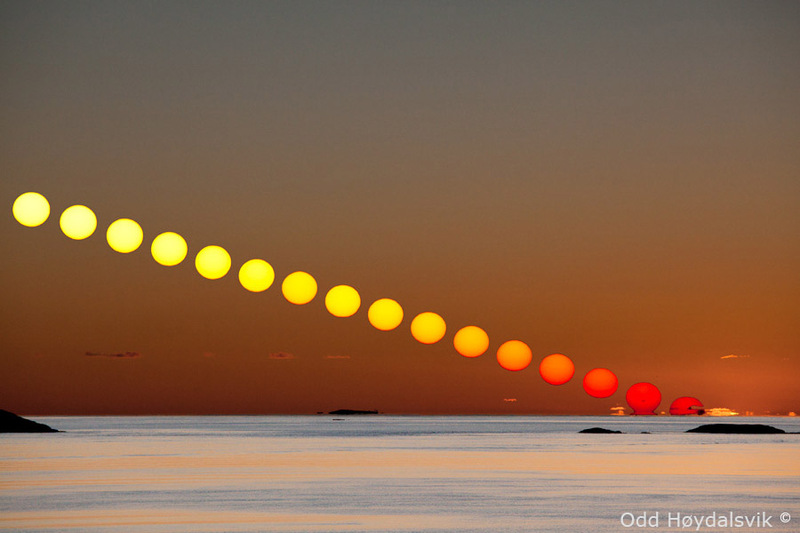 The Sun reaches the highest point above horizon at noon each day and this is all ancient astronomers needed to observe (the angle). 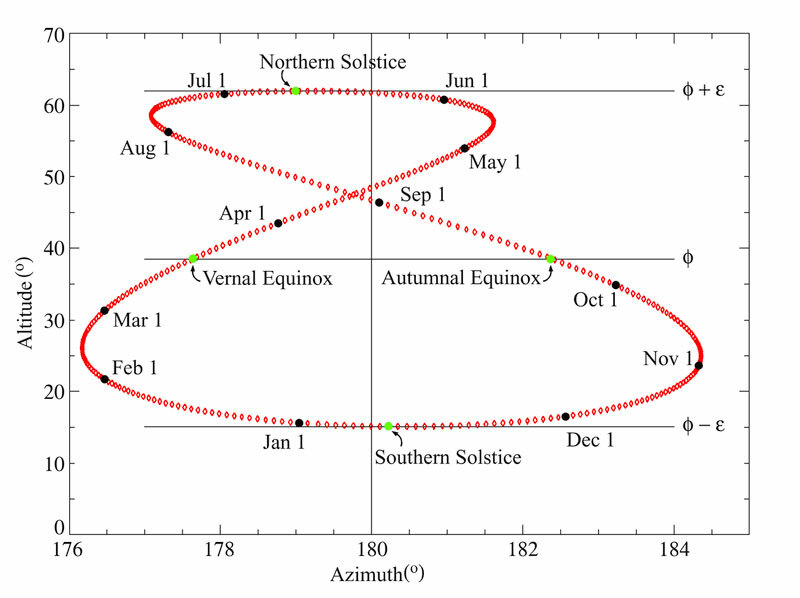 Since the Earth’s mean solar day is almost exactly 24 hours, an analemma can be traced by plotting the position of the Sun as viewed from a fixed position on Earth at the same clock time every day for an entire year. The resulting curve resembles a figure of eight. An analemma is basically the figure “8” loop that results when one observes the position of the sun at the same time during the day over the course of a year. As a result of the earth’s tilt about its axis (23.5°) and its elliptical orbit about the sun, the location of the sun is not constant from day to day when observed at the same time on each day over a period of twelve months. Furthermore, this loop will be inclined at different angles depending on one’s geographical latitude. Copyright © 2001-2011, Anthony Ayiomamitis. All rights reserved. Based on the above observations, we can see that it is not difficult to notice the basic movements of the Earth. Two of them (daily and annual cycle) are easily noticeable by anyone within a short period of observing (1 day for the rotation cycle and 1 year for the orbital cycle). The 3rd cycle called precession (also known as Platonic Year ) would take longer to observe . Although it is 25,920 years cycle, it can be noticed in just 36 years as the result of systematic observations of the night sky. 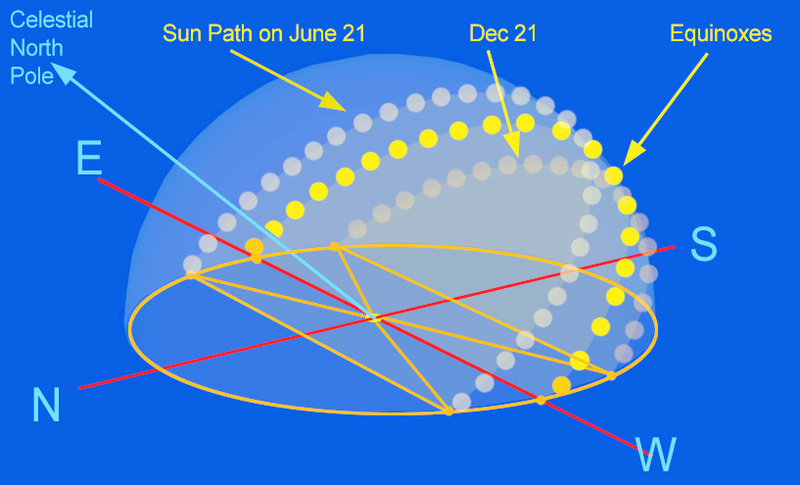 Precession is causing slow regression of the apparent position of the Sun relative to the backdrop of the stars at some seasonally fixed time, say the vernal equinox. This change is only 1 degree in 72 years (25,920/360 = 72) . 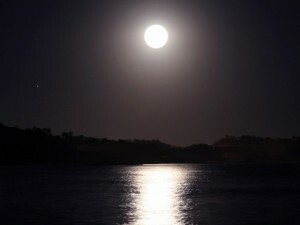 Considering the Sun and the Moon have angular diameters of about half a degree, it is reasonable to say that any changes in the night sky of this magnitude should be easily observable, therefore precession is noticeable in just 36 years (half degree change). The easiest way to record spatial observations — other than by framing them against a prominent topographic features — was by erecting durable markers of their own in the landscape (including pyramids and temples) to calibrate the rising or setting azimuths of the sun, moon, planets and stars. Nabta Playa, Stonehenge, Chichen Itza are just few examples. In the central plaza of Zempoala, just beneath the massive pyramids that frame its northeastern corner, are three intriguing rings of stone, each fashioned of rounded beach cobbles cemented together to form a series of small, stepped pillars. The largest of the rings contains 43 of the stepped pillars, the middle- sized ring has 28 such features, and the smallest ring numbers 13 stepped pillars around its circumference. 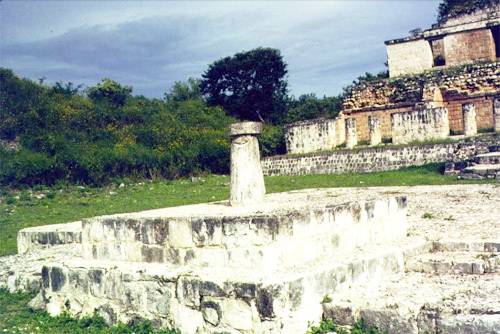 It would appear that the three rings were used to calibrate different astronomical cycles, possibly by moving a marker or an idol from one stepped pillar to the next with each passing day (in somewhat the same way that has been suggested for recording the passage of time at the Pyramid of the Niches at El Tajín). Astronomers also used very simple devices to measure the altitude of a celestial body above the horizon. Among them were the quadrant, cross staff and (later) the astrolabe. 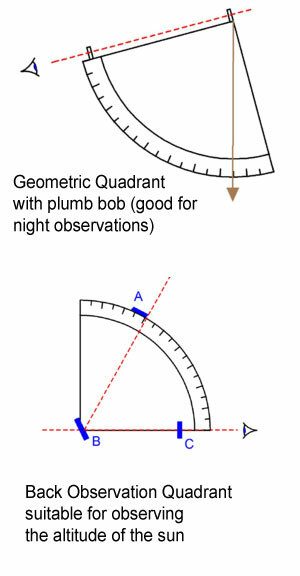 A quadrant is an instrument that is used to measure angles up to 90°. With “Back Observation Quadrant”, the observer viewed the horizon from a sight vane (C in the figure on the right) through a slit in the horizon vane (B). This ensured the instrument was level. 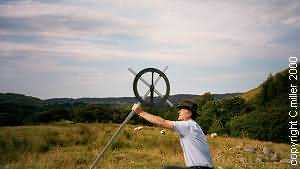 The observer moved the shadow vane (A) to a position on the graduated scale so as to cause its shadow to appear coincident with the level of the horizon on the horizon vane. This angle was the elevation of the sun. Note: Chrichton Miller proposed recently that version of cross with circle and plumb bob could be one of the early astronomical instruments. He discovered that the only appropriate instrument that could have been used by the architect, in the place of a theodolite, was a derivative of the cross, with the addition of a plumb-line. This incredibly simple, yet complex instrument, has the potential to measure angles and inclinations to an accuracy of 1 minute of arc or 1/60th of a degree, depending on the size of the instrument used. This is an extraordinary accuracy for what appears to be only two pieces of wood, a scale and a plumbline. One of the most interesting but obscure abilities of the Cross is its capability to take sidereal measurements. 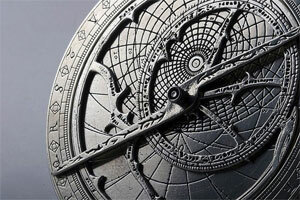 Astrolabe was originally used by astronomers to find the position of the stars and planets. Position of various stars and planets are marked on the face of the astrolabe and by setting the moveable parts of the astrolabe to a specific dates and times, the entire sky, both visible and invisible, is represented on the face of the instrument. Typical uses of the Astrolabe include finding the time during the day or night, finding the time of a celestial event such as sunrise or sunset and as a handy reference of celestial positions. The oldest known astrolabes were created a few centuries BC, possibly by Hipparchus. 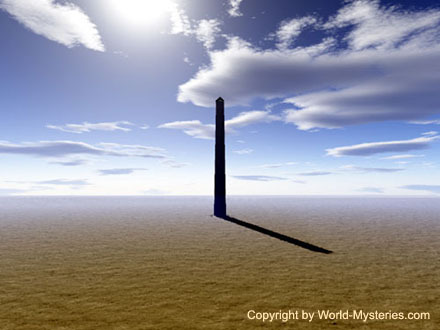 To determine noon time and cardinal points, ancient astronomers used obelisks (set vertically with use of a plumb line). 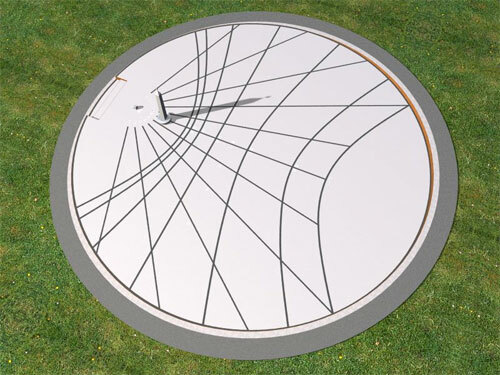 The gnomon is the part of a sundial that casts the shadow. In the northern hemisphere, the shadow-casting edge is normally oriented so that it points north and is parallel to the rotation axis of the Earth. That is, it is inclined to the horizontal at an angle that equals the latitude of the sundial’s location. At present, such a gnomon should thus point almost precisely at Polaris, as this is within a degree of the North celestial pole. On some sundials, the gnomon is vertical. These were usually used in former times for observing the altitude of the Sun, especially when on the meridian. The style is the part of the gnomon that casts the shadow. This can change as the sun moves. For example, the upper west edge of the gnomon might be the style in the morning and the upper east edge might be the style in the afternoon. Polaris (Alpha Ursae Minoris, commonly called North(ern) Star, Pole Star, or Lodestar) is the brightest star in the constellation Ursa Minor. Today it is very close to the north celestial pole, making it the current northern pole star. Over long periods of time (hundreds of years), precession of the Earth’s axis of rotation causes it to point to other regions of the sky, tracing out a circle over 25,900 years. 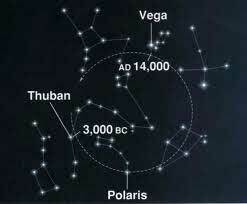 Other stars along this circle would have served as the pole star in the past and will again in the future, including Beta Ursae Minoris , Thuban and Vega. As the result, ancient astronomers had to use other methods to precisely locate cardinal points (N, S, E, W). Simple methods of finding cardinal points are based on observing night sky or the Sun. This method does not work so well closer to the equator (i.e. between the Tropic of Cancer and the Tropic of Capricorn) since, in the northern hemisphere, the sun may be directly overhead or even to the north in summer. 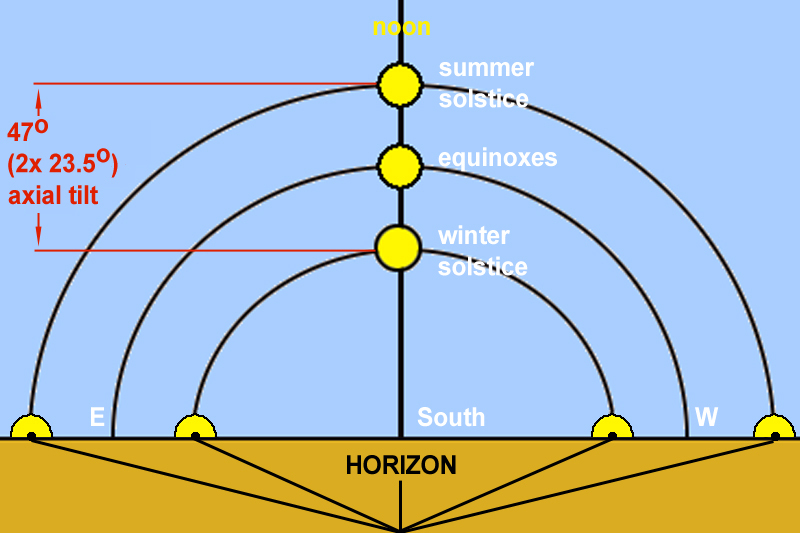 Once or twice each year, people who live at lower latitudes (within 23.5 degrees of the equator) can see the sun reach the zenith, an imaginary point directly overhead. A vertical post would make no shadow when the sun was at its zenith. The path the sun takes on these days—from sunrise through zenith, to sunset—is called the zenith passage. Right at the equator, the zenith passage coincides with the equinoxes. One of the simplest tools to measure angle of the sun above horizon is gnomon. 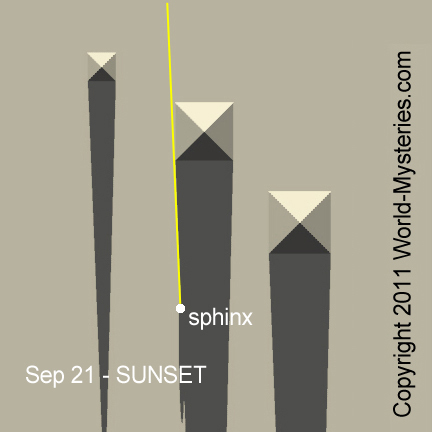 This simulation reveals how the Sphinx is aligned with the 2nd pyramid on Sep 21 equinox. 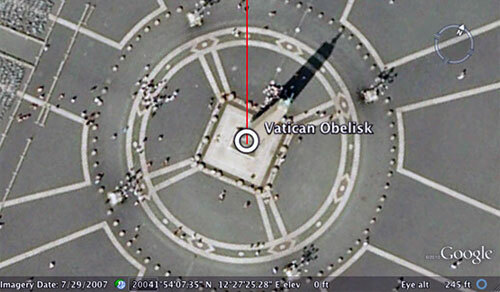 Wind rose markers are the 16 elliptical plaques embedded in the ring surrounding the ancient Egyptian obelisk at the center of Vatican Square. – observing one of bright circumpolar stars (e.g. Alkaid) and marking its 2 extreme positions crossing a horizontal line. 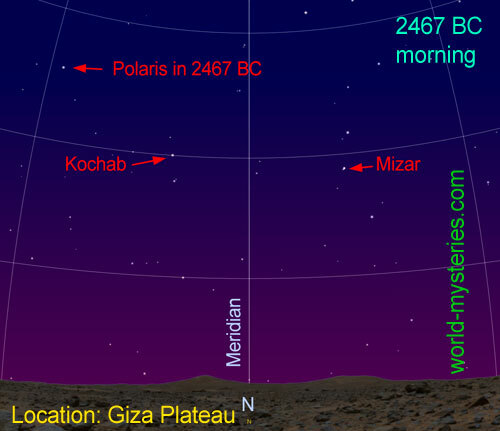 For example, 4,500 thousand years ago, Alkaid appeared in the evening sky 17 deg west of meridian and moved to 17 deg east of meridian before sunrise when it reached the same altitude. Dr. Kate Spence, a British Egyptologist, believes she may have solved two of the great mysteries of archaeology – how the ancient Egyptians aligned the pyramid with such remarkable geographical accuracy and when the vast royal tomb was built. 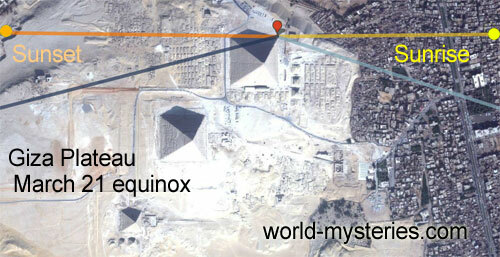 The Great Pyramid is extremely accurately aligned towards north. The sides deviate from true north by less than three ark minutes, that’s less than a twentieth of a degree, which is extremely accurate in terms of orientation. In the past the date of the ancient Egyptian pyramids has been a source of much debate among historians, who have put it at around the middle of the third millennium BC, by tracing the chronology of Kings. However, publishing her research in the scientific journal Nature, Dr Kate Spence says her theory gives a more precise date for the beginning of construction work on the Great Pyramid. 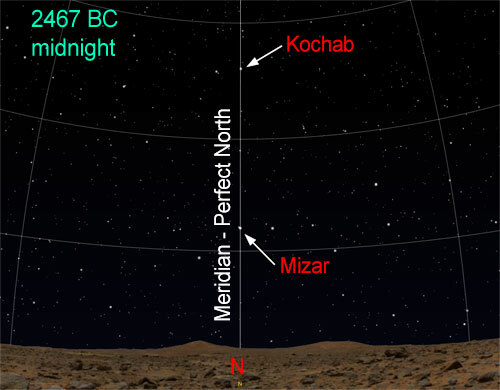 The celestial north pole was only aligned exactly with Kochab and Mizar in 2, 467 BC, which would put the beginning of building work about 70 years later than many archaeologists, have previously thought. 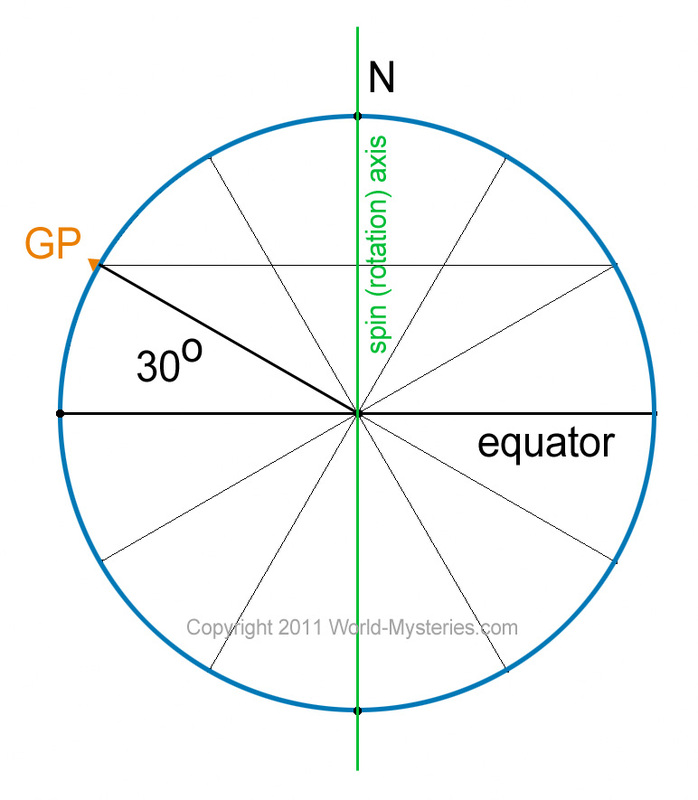 The angular distance north or south of the earth’s equator, measured in degrees along a meridian, as on a map or globe is called “latitude”. 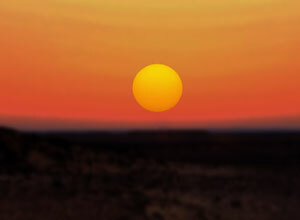 Angle of the sun above the horizon at noon on the day of equinox can give us geographic latitude of this location – example below: 90 – 60 = 30 deg. 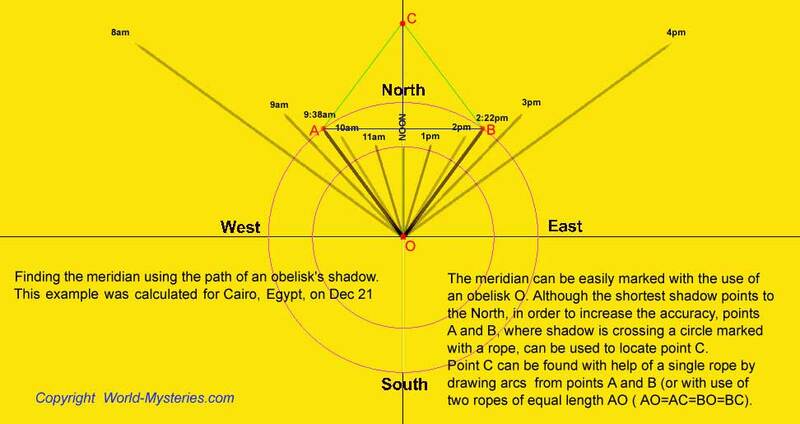 Simple geometry shows that the angle between the zenith and the celestial equator (i.e. 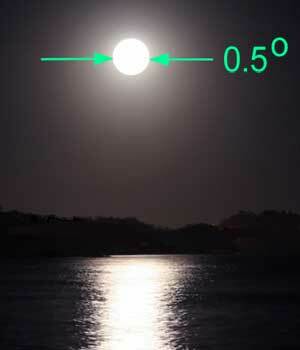 the zenith’s declination) must also be the angle between the north celestial pole and the north horizon. Measuring latitude using the sun can only be done at noon, when the sun is at its highest point in the sky. 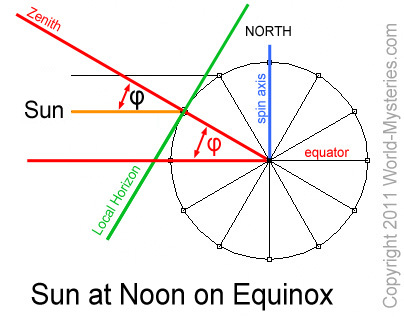 If you measure it on equinox the angle Phi is the latitude. On any other day you will have to compensate for the angle of the axial tilt (23.5 deg). Since the zenith’s declination is equal to one’s latitude, one can determine his/her latitude by measuring the altitude of the celestial North Pole (currently well approximated by position of the star called Polaris). Measuring latitude using the sun can only be done at noon, when the sun is at its highest point in the sky. The study of how people in the ancient past “have understood and used the phenomena in the sky, and what role the sky played in their cultures is called “archaeoastronomy”. 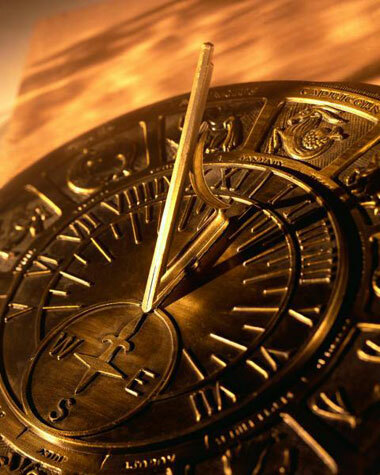 In the “Ancient Timekeepers, Part 3: Archaeoastronomy” we are presenting ancient calendars and the evidence of very good understanding by the ancient people of astronomical cycles of our planet. Examples of such evidence can be found in surviving ancient writings (Mesoamerica, Egypt and India) and monuments. Places like Stonehenge, Pyramids of Egypt and Mesoamerica, have encoded in their location, orientation, shape and dimensions incredible understanding of astronomy.